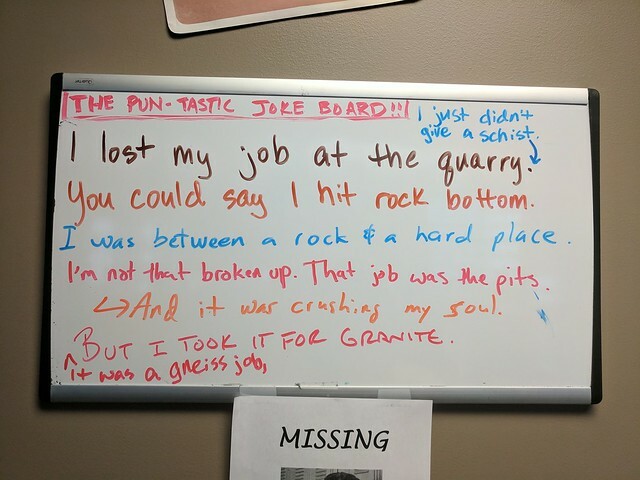 But one thing I’ve done that I’m actually proud of, that came out of my own head, is the joke board at work. 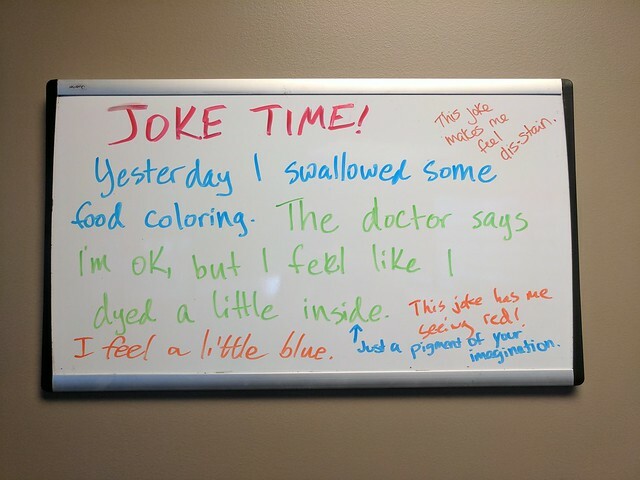 The premise of the joke board is simple: Every morning when I get in to the office, I spend a few minutes scouring the Interwebs for the best, freshest, punniest dad-style joke and I write it up on a small whiteboard I’ve appropriated for the task. (Lately I’ve also posted it to a dedicated room on the company’s internal chat service.) 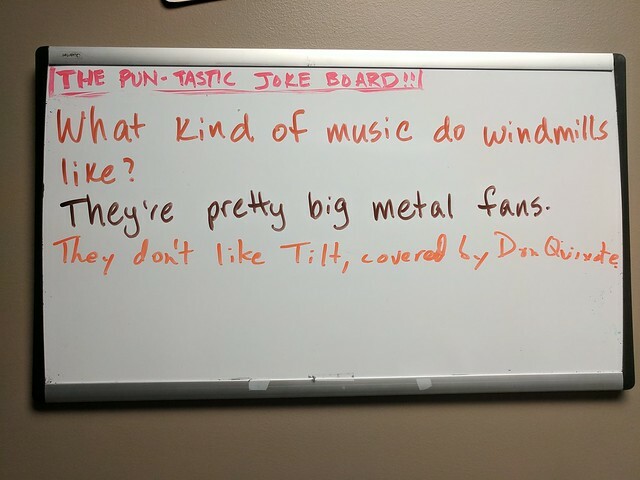 If people have additions or further puns, they write or post them. Then we do it all again the next day. 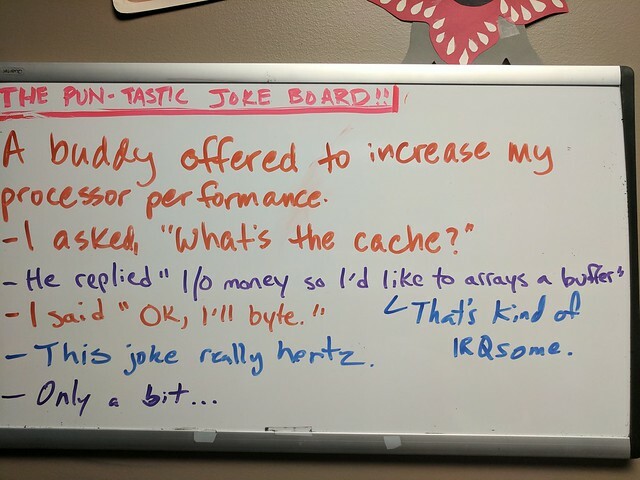 People sometimes come by my desk just to see the joke board. A hiring manager walks prospective employees by in a tour of the office, pointing it out specifically. For me, the greatest enjoyment comes from watching people read and react to the day’s joke, usually with a huge groan. It keeps me looking for jokes even on days when nothing’s funny. Oddly, I’m not actually very good at making up puns myself. 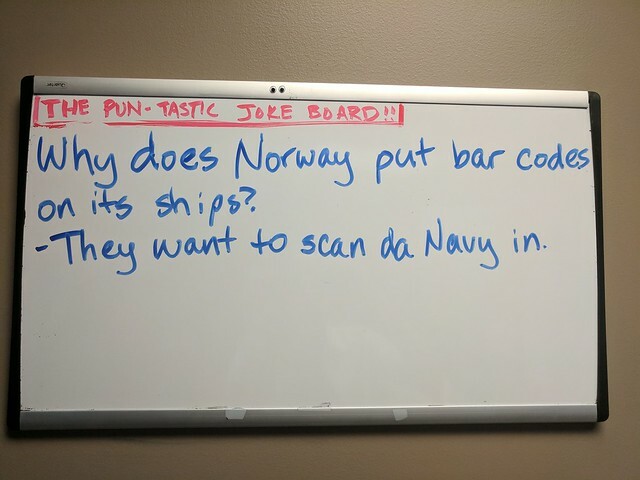 But I feel I can appreciate puns, and I’m never afraid of sharing them and looking stupid. All along I’ve been taking pictures of joke boards that stood out as particularly amusing or well-participated. 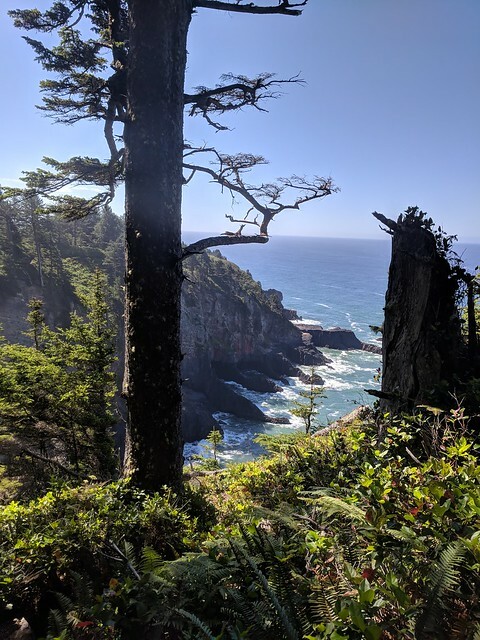 I’ve collected all these photos into a Flickr album that I’m enjoying, and I hope y’all do, too. I’ll try to keep it fairly fresh. Just a pigment of your imagination. I just didn’t give a schist. I just love this joke so much. Approved by my ethnically Norwegian friend. If those tickled your funny bone, there’s lots more in that vein in the Flickr Joke Board album. I’ll try to share those occasionally as I run across ’em, too. 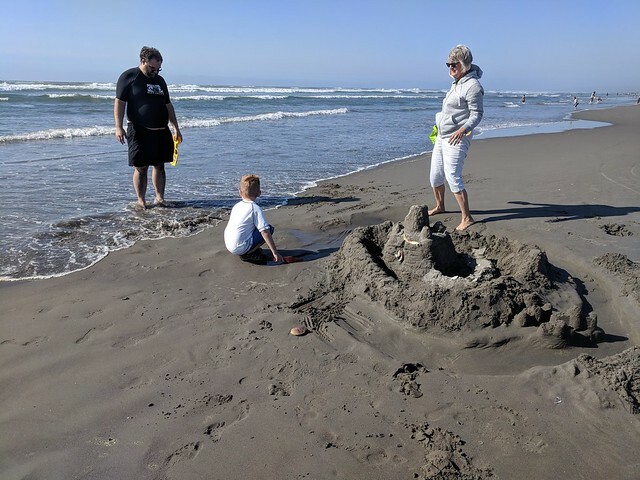 This year our family trip to Seaside took place over Labor Day week, later in the year than we usually go. 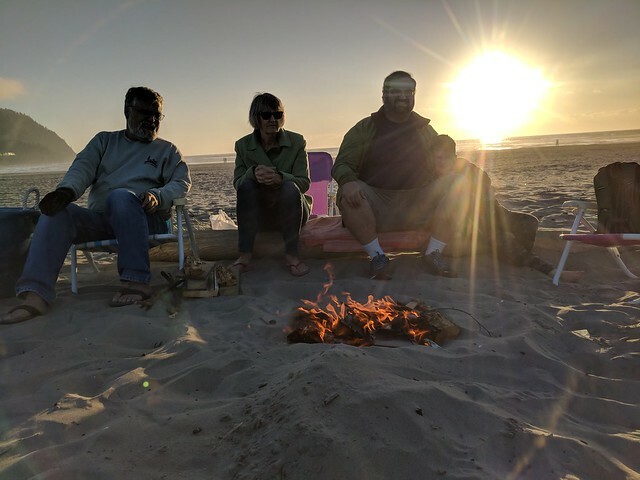 The last couple years I’ve skipped it, but this year I came along, and I’m so glad I did: Not only did the weather produce possibly the finest stretch of days I’ve ever experienced on the Oregon Coast, but we just had the most unalloyed fun of any family vacation I can think of to date. 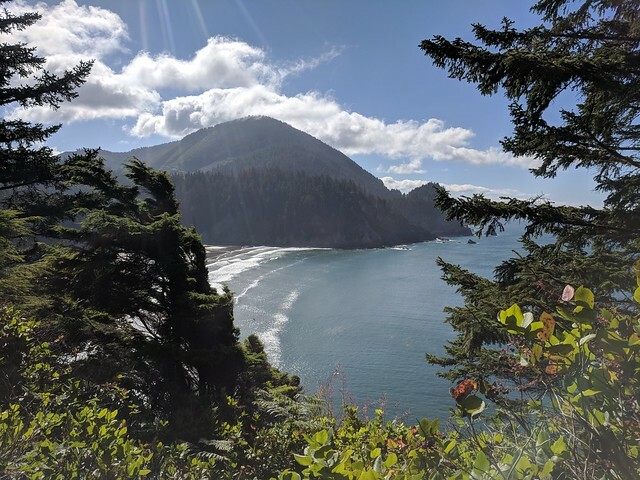 We drove down on the Sunday before Labor Day, and traffic was minimal. 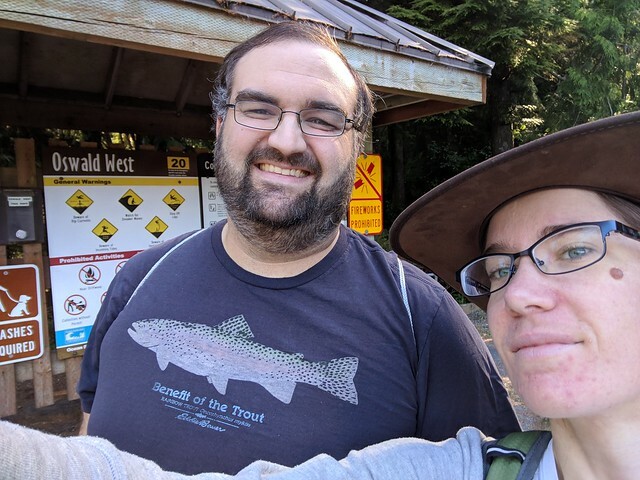 Ian and I had planned out a bunch of possible places to stop to charge the car, in case we couldn’t make it, but we had plenty of charge remaining when we arrived — 47 miles minimum, after driving about 210 miles. For an electric car, that’s pretty great. It started our vacation off on the right foot, and it kept going well from there. 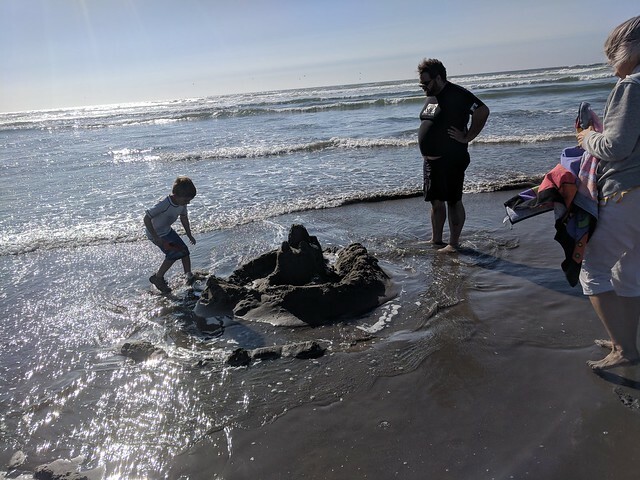 Naturally, we went to the beach first thing. 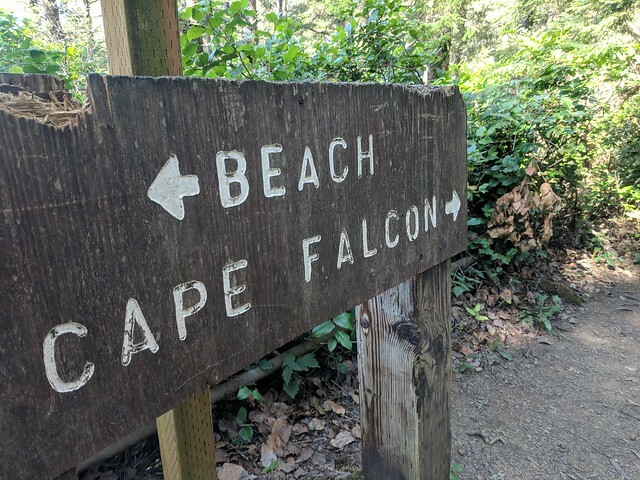 On Monday, Ian and I went for a hike out past Cape Falcon. That evening, we let Benji stay up “late” (8:00 pm! Wow!) 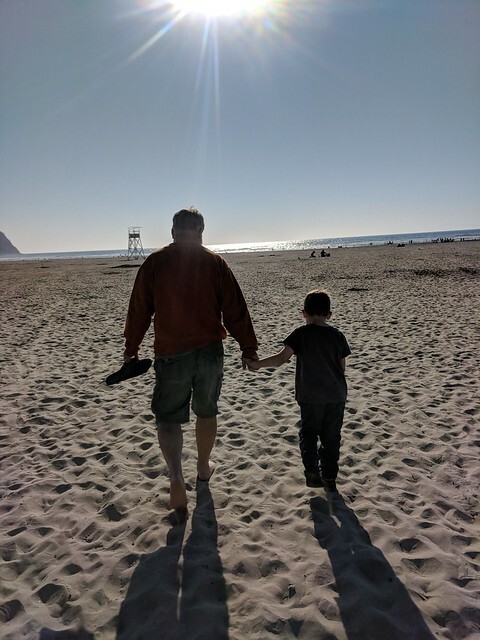 to do his first-ever beach fire and s’mores. Needless to say, he loved it. Marshmallows were popular, of course, as was burning various things. 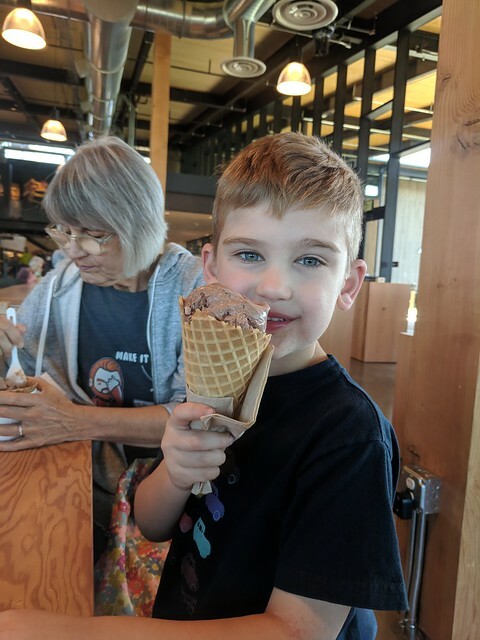 The next day, we drove to the Tillamook Cheese Factory, where Benji took care of the most important part of the day: ice cream. 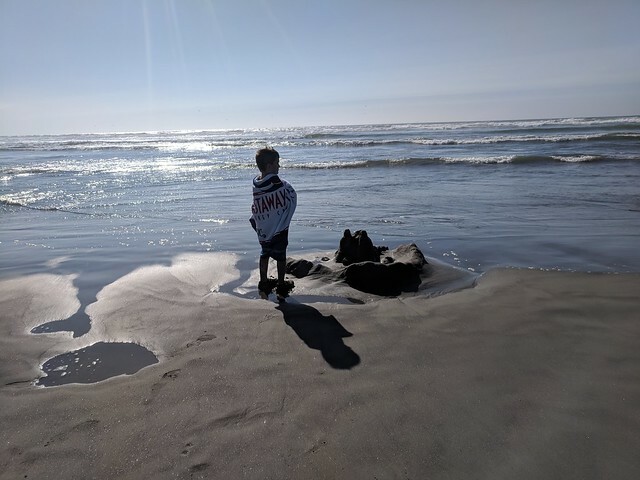 We had enough time, and he was doing well enough, that we played for a long time at Oswald West State Park on the way home. 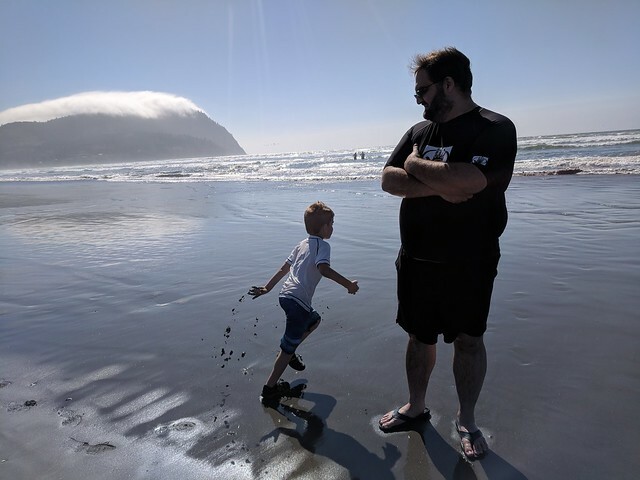 We weren’t actually prepared to play in the water, so Benji ended up with no pants or undies… but the shirt was just long enough. 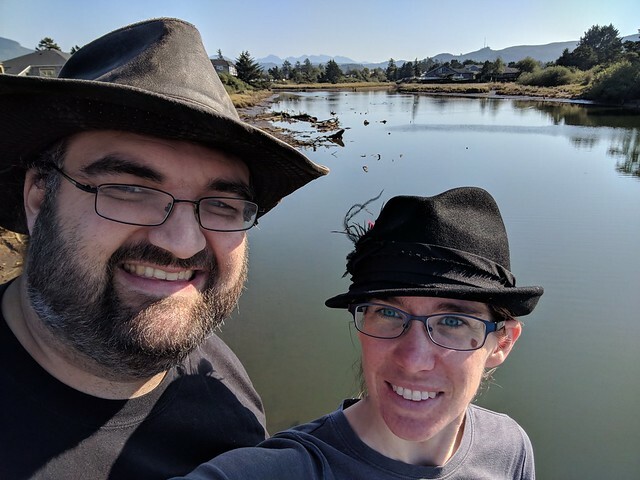 The next day was our last full day in Seaside, and Ian and I did a few errand-type things — I got a massage, Ian went to the outlet malls, and we both bought hats. We also went and saw Mission Impossible: Fallout in the Seaside movie theater, which was crammed with two other people. I never saw an actual employee the whole time. Benji hung out with Grammy and Papa and they put him to bed, so we got a little date night. It was nice! 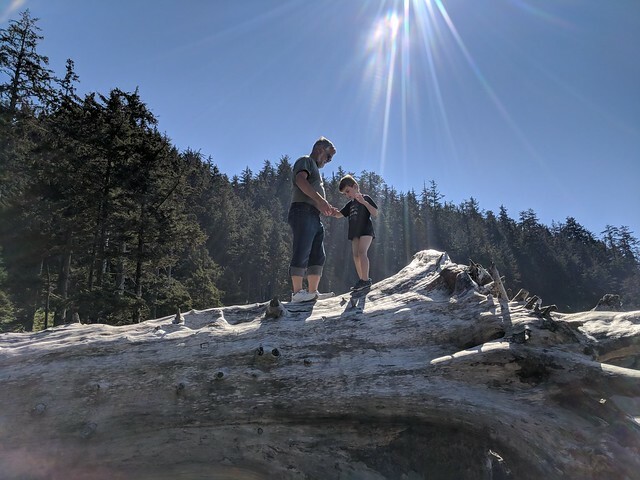 And that was pretty much the vacation. 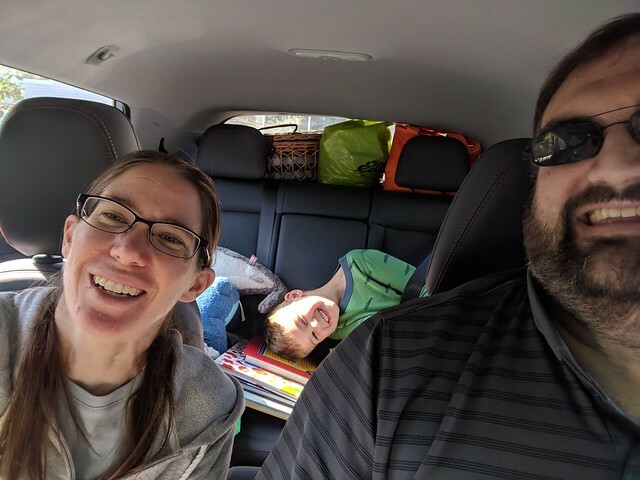 We drove home on Thursday and dove into real life again, with a school meeting on Friday and then a regular weekend before Benji’s first week at school. It was a great break.